ATLANTA (May 7, 2014) -- Searching for that "purrfect" way to celebrate Mother’s Day this year? 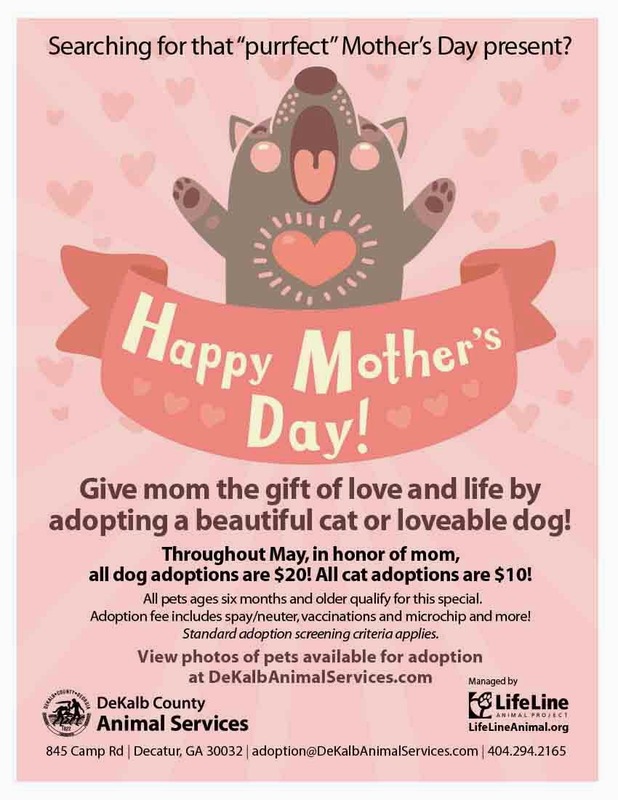 Why not give the gift of love and life by adopting a beautiful cat or loveable dog from DeKalb County Animal Services (DCAS). In honor of all mothers and those who love mothers, DCAS is offering special adoption rates on adult (six months or older) dogs and cats during the month of May – only $20 for dogs and $10 for cats. All animals will be spayed/neutered, vaccinated and microchipped for this special rate. Regular screening criteria applies to ensure the animals are going to good homes. "It’s springtime, and while many people are eager to adopt a kitten or puppy, we also have many great adult cats and dogs who are waiting in the shelter for a home," said DCAS Shelter Director Susan Feingold. "We have hundreds of great pets who are in need of that special person and will provide many years of love in return." To view the wonderful animals available for adoption at DCAS, please visit www.dekalbanimalservices.com.